Detained pro-democracy leader Aung San Suu Kyi has said she is ready to co-operate with Burma's military junta. In a written statement, Ms Suu Kyi said that she had made the decision "in the interest of the nation". Earlier, the ruling junta announced that Ms Suu Kyi would be allowed to meet her political allies for the first time in three years. She will meet executives of her National League for Democracy, along with a government minister, on Friday. 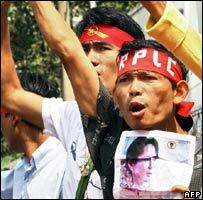 Ms Suu Kyi's party won polls in 1990 but was never allowed to take power. The junta has kept her under house arrest in Burma's main city, Rangoon, for 12 of the past 18 years. Her statement was read to reporters in Singapore by UN special envoy Ibrahim Gambari, who has just completed a six-day visit to Burma - his second since protests were suppressed in September. Shortly after his departure, the Burmese government made the announcement that Ms Suu Kyi would be allowed to meet with her party colleagues. The announcement, carried on state TV and radio, said she will meet Labour Minister Aung Kyi, the official appointed to act as a liaison between her and the junta. Military officials said arrangements had been made for her "to meet with the NLD central executive committee on the same day". The NLD confirmed it had received an invitation to hold talks with Ms Suu Kyi. She last met party members in May 2004. Ms Suu Kyi welcomed the labour minister's appointment as liaison in her statement, saying their first meeting, on 25 October, had been "constructive" and that she looked forward to future dialogue. In this, she said she would be "guided by the policies and wishes" of the NLD but would also need to consult with other political and ethnic groups. She also thanked the UN for its "unwavering support" for national reconciliation, democracy and human rights in Burma. Earlier, the UN said Mr Gambari's visit had opened a path to "substantive dialogue" between the ruling generals and Ms Suu Kyi. "The sooner such a dialogue can start, the better for Myanmar [Burma]," the UN said in a statement at the end of Mr Gambari's six-day visit. 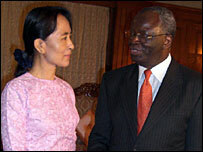 Mr Gambari met Ms Suu Kyi on Thursday, and the UN said she had authorised him to make a statement on her behalf. The UN also said Mr Gambari would return to Burma in the next few weeks to continue his dialogue with the junta. In September, the regime detained at least 3,000 people and opened fire on crowds, with dozens feared dead. On Wednesday, the Burmese authorities said all but 91 of those detained in the aftermath of the protests had now been freed. Human rights groups said at least 600 people were still in jail.